So who's the bearded fellow smiling with the glasses? Why that's my best friend Scott. If perchance you've read my 'bio' here on Smugmug, you now have a face to go with the nice comments about him. Not quite as visually gripping as many of my other candid shots in this gallery, you might ask what made me take this particular shot, which is disappointingly grainy and slightly out of focus to boot, (sometimes your camera's autofocus just misses the mark, what can I say!) 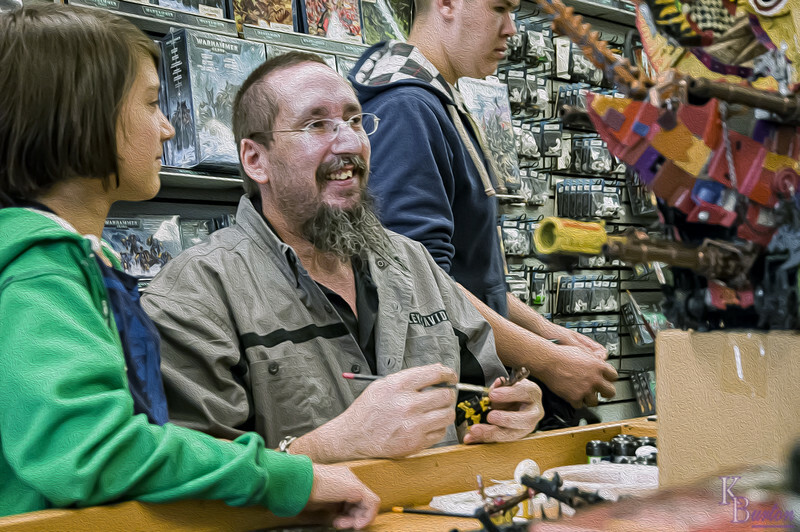 Well as it happened we were talking on the phone one day, and he mentioned that he was building a large scale model battle tank for the game 'Warhammer' that he plays with numerous friends of his at a store in the Village, called the Games Workshop. Now having been my best friend for over 20 years, and my roommate for 7 of them, I know when he goes big he goes all out. He once started building a flyable wood scale model of a DC-3 that had a 12ft. wing span. He mounted the wings on our living room wall, and suspended the fuselage from the ceiling between the living and dinning rooms, man it was so cool. Another time we each built HO racing car layouts that were so massive that they took up the entire living and dining rooms. The main straightaways alone on each layout (we built 4 different ones), were over 18ft long and it took a car two and a half minutes to complete just one lap! Don't ask about how difficult it was walking around the apartment while we were doing all this, we were just having too much fun to care. He told me the tank won first place for his Games Workshop store, at a worldwide convention that all the Games Workshop stores held this past August in Baltimore Maryland. And now that it had returned 'home' to his store here in the Village on 8th street, he was going to spend the next few months hand painting the colossal scale model, as he entered it in the contest unpainted in order to beat the deadline. So I decided to come down one day a get a few pictures of him at the store painting his imaginative creation.